This paper investigates the potential for a sustainable wood pellet torrefaction investment and its economic feasibility using samples of Namibian encroacher wood species. Two types of tests were carried out on the wood species by a technology vendor in France to evaluate the capability of producing a valuable bio-coal from the samples. The result shows that the Namibian wood has a high ash content of 37.1% and 18.4% when heated to a temperature of 400 °C and 300 °C, respectively, for 10 min. The mass yield at 300 °C was 76.15% with a low heating value (LHV) and a high heating value (HHV) of 17.84 MJ/Kg and 18.90 MJ/Kg, respectively, compared to 40.50% and LHV, HHV of 16.46 MJ/Kg and 16.98 MJ/Kg, respectively, for the 400 °C roasting. The study found that a stand-alone wood biomass torrefaction is currently not economically feasible in Namibia. A strategic partnership is needed to further test the technology and optimise its operation for a variety of purposes. David Ifeanyi Uchezuba, Salomo Mbai, Ibo Zimmerman and Johan Bruwer have contributed equally to this work. Johan Bruwer—Director Namfibre Pty Ltd Namibia, business consultant and environmental specialist. Namibia livestock production is a major agricultural export benchmark for the economy. The sector contributes much to ameliorate the Namibian continuous trade deficit since 2012 which grew by 49.9% over the last decade . For instance, total export to South Africa in the second quarter of 2017 grew by 10.3% from NS 2.861 million to N$3.15 million. This growth was due to diamond and livestock exports . Because of the importance of the livestock sector to the Namibian economy, rangeland management is a top priority. One of the key areas being amongst others, the management of the encroacher bush species. An encroacher bush species is a plant species that is evasive to natural control with obnoxious characteristics such as undesired woody quality. This makes it unpalatable for consumption by the animals as a result, it produces excessive leafy growth leading to (a) imbalance in the grass vegetation, (b) imbalance in the wood-vegetative ratio, (c) a decrease in biodiversity, (d) the depleting of the ground-water resource, and (e) a decrease in the carrying capacity of the grass and woodland ecosystem . According to several reports, Namibia is largely bush-encroached as a result of habitat change [18, 23, 24]. The reports estimate that approximately 26–30 million hectares of land in Namibia is bush-encroached. SAIEA et al. (2016) and  suggested estimate as high as 45 million hectares. This culminates in the decline of carrying capacity for rangeland grazing from 10 ha per Large Stock Unit (LSU) to 20 or 30 ha per LSU leading to an estimated production loss of about 3 kg carcass weight per hectare at 2002 price . The loss in average livestock production results in a loss in farm revenue of over N$700 million per annum . Through policy initiatives such as the National Agricultural Policy (NAP) (2015) ; the National Drought Policy (NDP)  and the Namibian Soil Conservation Act, (Act 76 of 1969) , the government established a mechanism to support the combating of bush encroachment through sustainable rangeland management practices which includes amongst others: the development of de-bushing programmes and the establishment of agro-investment enterprise including the Small Medium Enterprises (SME) over short and long term. The aim is to encourage the development of economic projects that will utilise the encroacher wood biomass for the production of renewable energy fuels for local and export markets. According to [18, 22], bush control and biomass utilisation have the potential of generating a sustainable net benefit of about N$ 48 billion over 25 years creating about 10,000 jobs per annum. However, the potential technology of wood biomass production is not easily available in Africa and in most part of the world besides, the economic feasibility of such investment is quite uncertain. Nevertheless, the bush encroachment problem in Namibia offers the possibility for harvesting some of the bush for multiple purposes including renewable energy. However, the quality and accessibility of wood from Namibian bush differ considerably from those of the wood most commonly used for energy generation in other parts of the world. This is because Namibian wood species are hard and contain silica compared to the bush from other environments. Given the above-stated problems, there is greater uncertainty in investing in wood biomass production/torrefaction technology in Namibia in terms of the available technology, investment opportunities and their feasibility thereof. Therefore, the major objective of this study is to investigate the potential for a sustainable agro-wood biomass torrefaction investment and the economic feasibility of producing torrefied wood pellets using samples of Namibian encroacher wood species in the Krumhuk Agricultural Centre, Khomas region of Namibia. The activities outlined to achieve the set objectives are as follows: (a) Identify a technology partner for the supply of wood biomass torrefaction machinery and equipment, (b) Analyse market options for biomass valorisation (c) Initiate tests on Namibian biomass (feedstock) representative of the encroacher bush species through the identified technology, and (d) determine the basic economic feasibility of the project . This is a development pilot project initiated by Aris Biofuels Company (ABC) and commissioned by the Ministry of Industrialisation, Small and Medium Enterprise Development, and Trade. Krumhuk is chosen as the project site because of the availability of wood biomass (invader bush) on the 10,000 ha project site, and the proximity of the project site to the commercial nerve centre, Windhoek. This research will help answer the question about potential investment prospect in wood biomass. The statistics about the energy content and the ash characteristic of Namibian wood provided in this study is an important parameter for future engagement in wood torrefaction. This is the major contribution of the study. On the other hand, the uncertainty surrounding the financial feasibility of the various business cases in Namibia has not been empirically investigated before. This study filled the gap. The rest of the paper is structured as follows. The next paragraph discusses torrefaction. Following, the method employed to test the potential for the available technology to process Namibian wood is described. The results and discussions are given in the subsequent sections followed by the concluding remarks and recommendations. Fossil fuel such as coal has been a major source of energy for centuries. It is used for both energy and heat production in households and industries across the globe and the demand is on the increase . Due to its sustained use over time, it is rapidly being depleted and there is uncertainty over its availability and affordability in the future. Biomass pellets are used as a substitute for coal in biomass-fired and biomass–coal co-fired power plants, and in small-type industrial boilers and burners. The use of biomass in the form of biomass pellets (conventional wood pellets or white pellets) gained momentum as a renewable energy source or green fuel for power generation in Europe at the early part of the twenty-first century when a renewed debate for alternative and renewable heat and power generation began. As a result of the growing demand, biomass pellets production for energy has grown worldwide. In Europe, production grows from 3 metric tons in 2003 to 27 metric tons and is projected to reach 50 to 80 metric tons in 2020 . From 2002 to 2006, internal demand for wood pellets in the USA increased by 200% . Biomass pellet can be produced from a variety of feedstock such as agricultural by-products, crop residues, grass stalks and woods [4, 6, 15]. However, there is a narrow feedstock base for commercial production of biomass pellets . The conventional feedstock is wood biomass. Some inherent problems with wood biomass pellet that makes it less desired as a feedstock are low bulk density, high moisture content, hydrophilicity and low calorific value [1, 5, 25]. Adams et al. (2015) showed a bulk density range of 250–300 KgM3 and 550–700 KgM3 for wood chips and wood pellets, respectively. Their moisture content ranges from 30–40 wt% and 7–10wt%, respectively. Wood biomass pellet has a low energy value about 15–16 MJ/Kg or GJ/Ton , or less compared to torrefied wood and coal, and it is bulky . The bulkiness creates challenges during transportation, handling, and storage and due to low energy value, very high volumes of feedstock are needed. In addition, conventional biomass pellets do not have the same grinding characteristics as coal, making grinding with unmodified coal equipment very difficult when used in high utility machinery. Furthermore, conventional biomass pellets have relatively poor durability due to their reliance on internal lignin as the main form of a binder during pelleting, resulting in the product generating dust during bulk handling and extremely susceptible to moisture degradation. These limitations are overcome through biomass torrefaction. Natural wood or agricultural biomass contains lignocellulose materials, volatile matter such as organic oils, dissolved air, gases, and moisture content. Torrefaction is a mild pyrolysis or carbonation (roasting) of wood or agricultural biomass to a temperature ranging from about 200–400 °C under high pressure in the absence of oxygen , resulting in the loss of moisture through a thermo-condensation process and the partial loss of the volatile matter (devolatilisation) in the biomass to about 20% [1, 6]. The high temperature of the torrefaction process coupled with the time the biomass is heated results in the breakdown of the tough hemicellulose, lignin and cellulose cell walls to produce torrefied biomass that is brittle, highly reactive, grindable, easier to homogenise and hydrophobic (water resistant). The physical features of the product vary with the level of torrefaction. The moisture content for torrefied wood and wood pellets are between 1 and 5 wt%. Their low calorific ranges from 19–23 MJ/Kg and 20–24 MJ/Kg, respectively, compared to coal (23–28 MJ/Kg). This implies that torrefaction with densification (Pelletisation) produces a better energy yield . 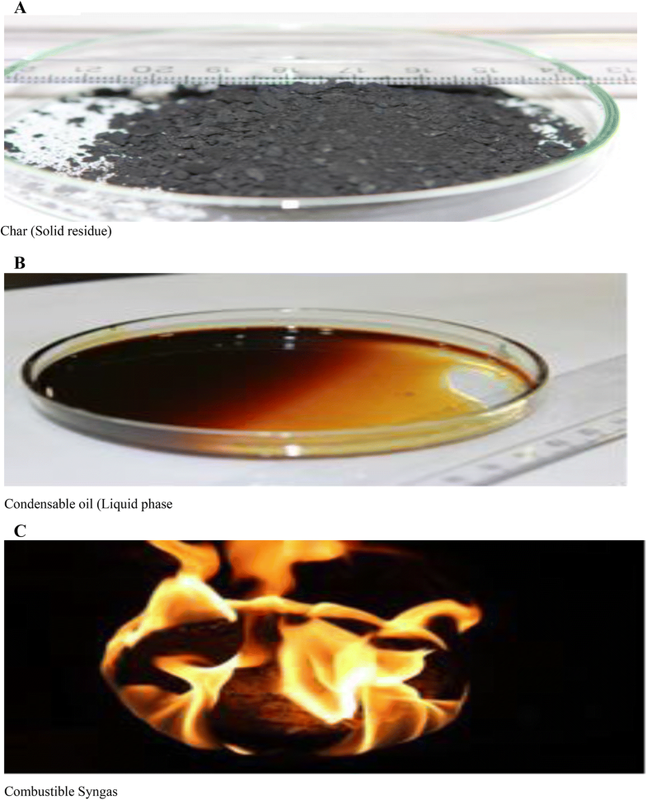 The by-product of biomass torrefaction are (a) a black uniform solid product, (b) condensable substances such as water, some organic compounds, and lipids, (c) non-condensable gases such as carbon dioxide, carbon monoxide and methane and (d) heat [2, 25]. The yield of these products depends on the reaction temperature; the heating rate; inert environment; residence time; ambient pressure; flexible feedstock; feedstock moisture and feedstock particle size [2, 25]. At a given heating rate, the combustion reaction is more exothermic at a higher process temperate with higher yield provided the feedstock is not too hard, has minimal contamination with silica and low moisture content. Naturally, wood biomass has a high moisture content ranging from 10 to 50%, the lower the moisture content the better. However, the torrefaction process reduces this to about 1–3% . Because of the high moisture content, pre-dried feedstock is usually a starting material for torrefaction . The modalities for the research were determined as follows. Firstly, a French torrefaction technology supplier ETIA/Bio-Green/VT-Green was identified. The French ETIA/Bio-Green/VT-Green screw reactor technology was chosen for this project for various reasons. Their technology differs from most utility focused screw-type reactor used during the 2002–2012 period because it uses electricity rather than liquefied petroleum gas (LPG) to heat the screw conveyor that drives the roasting process. It also uses electricity to chill water which enables dry cooling of product on a chiller heat exchanger-closed water loop rather than quenching the torrefied product with water. Water use is, therefore, minimised, which is important in any water-scarce environment such as Namibia. These features indicate that the plant has niche-focused rather than a utility or stand-alone facility. This may be desirable for a torrefaction operation including bio-refinery. Another important feature of this torrefaction plant is that the product chiller condenses the condensable fraction of the process gas making it easier to harvest, and more importantly, the plant is also available as a mobile unit hence, more durable. The chosen plant may yield above 70%, (where 50–60%, i.e. 50 to 60 kg of product per 100 kg of biomass processed) is usually the conservative estimate taken for roasting business case calculations. This should is compared to 16 to 23% of charcoal produced per 100 kg of biomass processed. The higher yield (23%) is likely to be the result of burning desirable trees rather than encroacher bush per se. Representative samples of wood biomass harvested in Namibia were exported for testing on VT-Green technology to generate a form of bio-coal. The exported wood biomass was harvested from Omaruru and Otavi and these include the following species; Acacia mellifera, Acacia reficiens, Acacia erubescens, and Dichrostachys cineria. Two types of tests were carried out by the technology vendors to evaluate the Bio-green capability to produce a valuable bio-coal from a representative sample of the Namibian wood with the best yield-calorific value. To this end, two batches were implemented with two different temperatures (300 °C and 400 °C) and the same dwell time (10 min). The Namibian feedstock is composed of different cutting residues. The size of the sample of biomass was too large to be directly transformed in the Bio-green process. Two successive screenings were carried out to obtain a product compatible with the process. The screening process is shown in Fig. 1. 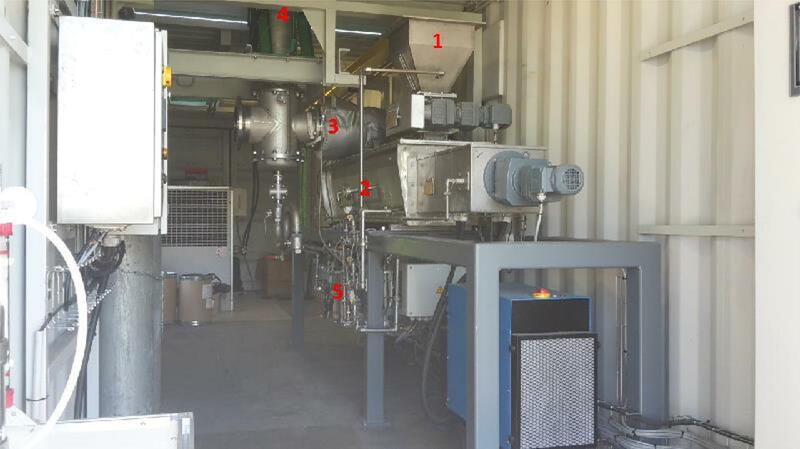 The biomass material screening process. Parameters of the two tests are presented in Table 1. Pilot tests were carried out with the VT-Green pilot bench reactor located in Saint-Bonnet de Rochefort, France. The reactor is based on spirajoule unit with screw diameter 130 mm. The apparent density of the Namibian feedstock was 266 g/l with a humidity of 8.86%. The feedstock passed through a pyrolysis process. The pyrolysis chamber is shown in Fig. 2. The feedstock was fed into the hopper at room temperature at a feeding rate of 12 kg/h for test 1 and 16 kg/h for test 2 (See the chamber labelled 1). The material enters the reactor through a rotary valve (Chamber 2). During the 10 min of residence time, the product was heated up to the desired temperatures (400 °C and 300 °C) and converted into a solid and gaseous fraction (Table 1). Gas fraction exited the reactor through the insulated gas collar located at the first third of spirajoule and then cooled at 5 °C in a double-jacket condenser powered by cold water. During cooling, the liquid phase was extracted through the syphon system (Chamber 3). Solid product exited the pyrolysis chamber through the rotary valve at the end of spirajoule reactor and was cooled down into a flash cooler based on a double jacketed auger cooling screw mounted with water spraying device to the temperature less than 40 °C (Chamber 4). The non-condensable gas coming out from condenser is mounted constantly on gas analyser, GAS BOARD 3100R (Measuring range: CO: 0–30%, CO2: 0–40%, CH4: 0–100%, CnHm: 0–20%, O2: 0–25%, H2: 0–30% (Chamber 5). Before the start-up of each process, the system was purged of nitrogen inside the pyrolysis chamber. At the end of the pyrolysis process, the mass of the bio-coal and bio-oil at the condenser outlet were weighed and the mass yields were calculated for both products. The gas yield was calculated by difference. An online gas analysis was performed on the gas during the test. The gas analysis was carried out using an online gas analyser (GEIT GAS 3100 R). Gases were filtrated through isopropanol and three columns were filled with glass pearls and cotton wool in order to prevent damage to the analyser by tars and then finally treated to avoid interference with syngas yield. The overall results of the wood biomass tests are discussed in the result and discussion section. This section discusses the feasibility of establishing a torrefied wood pellet company which will be developed and operated at a profit by Aris Biofuel Company (ABC). Before obtaining the test results from the technology supplier, a detailed enterprise budget analysis was carried out for bush harvesting and processing options from an economic perspective. Income and expenditure projections were determined including net operational gain (loss) and return on investment. After obtaining the test results and the associated financial perspective from the technology vendor, internal rate of return (IRR) and payback period were calculated. Business case 1: Bush harvesting and supply This business case involves (a) the harvesting of wood biomass, (b) the chipping of the woods to produce wood chips, and (c) the supply of the wood chips as a feedstock for further processing. The method of harvesting wood biomass differs according to the level of mechanisation utilised in the harvesting process. The Deutsche Gesellschaft für Internationale Zusammenarbeit (GIZ)  report suggests five different harvesting methods namely: (a) Small-scale or manual harvesting, with a capacity of 16 m3/day wood chips or 800 tons per annum, (b) the light-duty harvesting method, with a capacity of 28 m3/day wood chips or 1400 tons per annum, (c) the semi-mechanised harvesting method, with a capacity of 120 m3/day or 6000 tons/annum of wood chips, (d) the commercial full-scale mechanised method, with a capacity of 160 m3/day or 8000 tons/annum, and (e) the larger commercial full-scale mechanised machine with a capacity of 400 m3/day or 20,000 tons per annum. Business case 2: Feedstock purchase, torrefaction, and supply The business case examined here involves the purchase of feedstock, the torrefaction, and the supply of torrefied wood. Business case 3: Wood harvesting, torrefaction, and supply investment This involves stand-alone harvesting and the torrefaction of wood biomass. According to the report from the technology vendor, three torrefaction technology capacities are available (1 ton/h, 500 kg/h and 350 kg/h). Using the three torrefaction capacities, an enterprise budget was conducted using information about income and expenditure gathered from the literature and from personal interviews with key stakeholders in the wood harvesting and chipping industry in Namibia. The results of the wood biomass tests and the enterprise budget described above are discussed next. Three products are obtained at the end of the process: char (solid residue, Fig. 3a), oil (liquid product Fig. 3b) and syngas (Fig. 3c). The mass of char and oil was measured, and the syngas yield was calculated from these data (Table 2). The result shows that at a higher temperature, the char yield is low (41%). This is consistent with the result by  who found low solid yield with higher temperatures. The yield for oil (30%) and gas (30%) are higher for 400 °C than 300 °C temperature. Further analyses of the compositions of these components are made in the subsequent tests. By-products obtained during pyrolysis treatment. Gas composition at steady state is given in Table 3. Higher temperature increases the pyrolytic gases concentration in the syngas. Indeed, in the 400 °C test, the syngas contains more carbon monoxide and carbon dioxide. The differences between test 1 and test 2 for the CH4, CnHn, and LHV (Low Heating Value) are not significant. The temperatures are too low to produce an energetic syngas. However, the 400 °C test produces more syngas (30% w/w of the biomass). Syngas composition at a stable state. The 300 °C bio-oil is more transparent than the 400 °C bio-oil, which contains some heavy phase (Table 4). The 300 °C bio-oil has higher moisture content than the 400 °C bio-oil whereas the carbon and nitrogen concentration is larger in the 400 °C bio-oil. These results can be explained by the conversion temperature; a higher temperature increases the break of molecular bonds and increases the condensable gas fraction. The process temperature explains also the calorific and molecular composition differences between the two bio-oils. High humidity reduces the HHV and the LHV while high carbon content increases these values (Table 4). The main difference between the bio-coal and other products are a higher ash content for the 400 °C bio-coal and a larger carbon, hydrogen, oxygen and sulphur content for the 300 °C bio-coal. Contrary to expectations, a better HHV and LHV was obtained at 300 °C than at 400 °C. In  and  higher energy yield is correlated with higher temperatures. This result is probably due to the high ash content of the feedstock (Table 4. As expected, the process temperature affects the yield and composition of each product. Indeed, the increase in the temperature improves the syngas and bio-oil yield but reduces bio-coal production. In order to confirm this result, it is important to operate the pyrolysis under two other temperature regimes such as 350 °C and 250 °C. The 350 °C temperature will be used to verify dual trend whereas, the 250 °C., will be used to check if the HHV can be increased while increasing the mass yield of the bio-coal. The test at 400 °C produced a mass yield of char of only 40.5% (Table 2). It is likely that the high ash content of the raw material contributed to this low yield. The test at 300 °C demonstrates the ability of the equipment to produce a high mass yield of 76.15% (Table 2), and surprisingly of a higher calorific value than at 400 °C (Table 4). It should be noted that the screening process followed to obtain a suitable size distribution in the absence of a biosizer resulted in an input much higher in ash than the base feedstock, whose base feedstock is a representative encroacher bush sample already high in ash (5.5%). Most importantly, the 400 °C range performance on this technology should be viewed as being above the official torrefaction range based on the characteristics of the condensed fraction. The technology is capable of a particularly wide torrefaction range as mentioned previously. However, additional tests are required to determine if it can be used to produce a bio-coal with Namibian wood biomass. The income and expenditure analysis of the business case 1 is shown in Appendix Table 5. The net income realised for the three largest operations is N$ 1,565,496, N$ 2, 218, 211 and N$ 6,147, 336, respectively. These investment options also yielded the largest return on investment. It should be noted that all cost outlays in Table 5 are conservative estimates, which are subject to change due to fluctuations in the macroeconomics in the country. The result in Table 6 shows that the wood purchase and torrefaction of the Namibian bush business case 2 will not have a positive net benefit to the investor. That is, it is not feasible as an independent business case. Like the result obtained for business case 2, business case 3 has a negative net benefit and economic loss (Table 7). It is clear that the stand-alone business proposal for ABC Company would be a risky investment. On the other hand, if incorporated into a bio-refinery, the risks would be greatly reduced and a complete economic analysis would most likely make better business sense. Income and expenditure analysis of bush harvesting and supply investment business case. Enterprise budget for Wood purchase, torrefaction and supply investment. Enterprise budget for wood harvesting, torrefaction and supply investment. Two European business cases (Biochar and bio-coal) supplied by the technology vendor were adapted to estimate cash flow for the Namibian case. An internal rate of return (IRR) of 23.1% and a payback period of 4.4 years were estimated for a commercial heat and biochar production over a 12 year period, for an initial capital investment of N$29.4 million (Table 8). The payback period obtained is consistent with  who found a payback period of 3 years in an experimental torrefaction project. The production of commercial heat is a first step in the production of a bio-refinery. Such a direct business opportunity is not currently available in Namibia. For local near stand-alone production of bio-coal (Table 9), the IRR is 1.9% and the payback period is 11 years for the same initial capital outlay as above. A reduced capital outlay as a result of a strategic partnership can alter this result significantly. The flexibility of the technology should, therefore, be employed to make bio-products including both biochar and bio-coal. Namibia’s bush encroachment problem offers the possibility of harvesting some of the bush for multiple purposes including renewable energy. However, the quality and accessibility of wood from Namibian bush differ considerably from those of wood most commonly used for energy generation in other parts of the world. Thus, it is necessary to recognise the difficulties these pose to the harvest, processing, and use of Namibian bush and the fact that the existing technology may not be suitable for the poor features of the Namibian wood biomass. 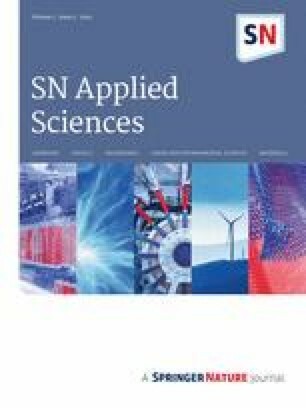 This study investigated the potential for sustainable technology, investment and the economic feasibility of producing torrefied wood pellets using samples of Namibian encroacher wood species in the Krumhuk Agricultural Centre, Khomas region of Namibia. A major challenge was to identify a technology partner for the supply of wood biomass torrefaction machinery and to determine the best case scenario for the wood biomass business development. A French company, ETIA/Bio-Green/VT-Green was identified as the technology vendor for the project. The results from the tests conducted by the technology vendor show that the Namibian wood has high ash content when heated to a temperature of 400 °C and 300 °C for 10 min, respectively, with a low bulk energy density for the 400 °C compared to the 300 °C roasting. On the economic viability perspective, the result shows that torrefaction as a stand-alone investment is not currently economically feasible in Namibia. The high ash content of white pellets from Namibian wood inhibits their use alone in energy generation, but alternatively, suggestions (not investigated in this research) would be to blend it with white pellets from softwood that has extremely low ash content. Such a blended product could satisfy a niche market. Due to the poor features of Namibian wood biomass and the high capital cost involved in wood biomass torrefaction, it is, therefore, recommended that potential investment in wood biomass torrefaction needs a strategic partnership with potential investors especially technology vendors. In addition, more research is needed to test the technology and optimise its operations for a variety of purposes. Furthermore, it is recommended that further tests be conducted on the Namibian wood under different operating conditions to determine possibilities for alternative products. The results would allow linkages to be designed with a bioreactor for improved efficiency, economic viability, environment sustainability, and job creation. The limitations of the study are worth mentioning. The proportion of sampled wood was small compared to the large population of encroacher wood species. This was because the tests were conducted in France as a result, selected wood species were used. Due to lack of data on machinery cost and operations, some of the cost items used in the enterprise budget were extrapolated from a business case supplied by European vendor ETIA/BIO-Green/VT-Green (Tables 8 and 9 in appendices). Exchange rate disparity may bias the real-time estimate. This study was funded by the Government of the Republic of Namibia (GRN) through the Ministry of Industrialisation, Trade and Small Medium Enterprise Development. The authors declare that this article is their original work. It is not published in any other journal or being considered for publication. If accepted for publication, the article will not be published elsewhere in the same form, in English or in any other language, including electronically without the written consent of the copyright holder. There is no conflict of interest that can bias this work. See Tables 5, 6, 7, 8, 9.